Today, the Denver Business Journal broke a story that Denver Mayor Michael Hancock is moving forward with city-wide construction defects reform. The legislature previously tried to pass a statewide construction defects law; however, most of the legislation was blocked by trial lawyer and state Sen. Morgan Carroll, who is now running against Rep. Mike Coffman in the Sixth Congressional District. Foley-Healy argued that the spate of new laws violate cities’ home-rule abilities because the ability to sue over defective construction is clearly an issue of statewide importance rather than of local concern. And she said that the first condo owner who discovers a defect and finds that they can’t take the builder to court will challenge the viability of any local laws on the subject. Plus, she said, the laws have done nothing to promote more affordable construction. Foley-Healy is a partner at a law firm specializing in Homeowners Association complaints, and is a frequent foe of construction defects reform. 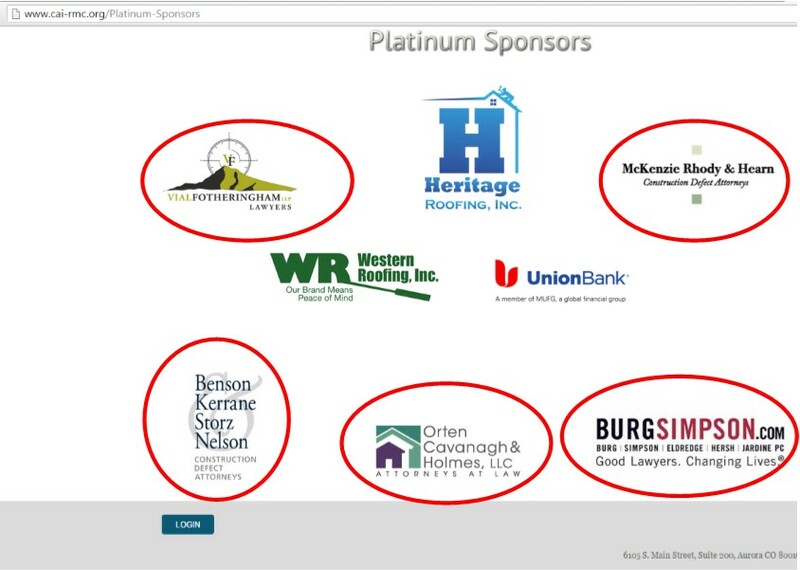 But, perhaps more interesting is the platinum sponsors that the Community Associations Institute has secured – they are almost all trial lawyers, and, specifically, those who . See the photo above. Here, we thought that Foley-Healy was really concerned with the little guy – the homeowner. No, she’s concerned about her friends and sponsors, the trial lawyers. Cry us a river, and shame on the media for falling for Community Associations Institute’s baloney.